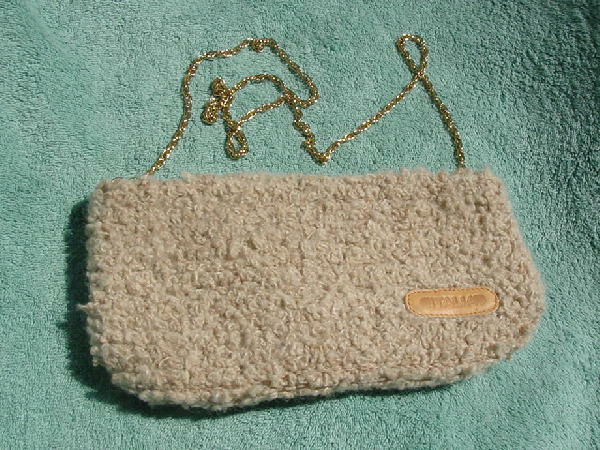 This soft curly looped light brown-wheat colored purse is by Italia and has a logo patch etched in tan leather on the front. It has side hinges so you pull to open and push to close. There is a 43" long gold-tone link shoulder chain (the model who owned it added the chain, which was originally a necklace), which you can tuck inside and then carry the purse as a clutch. The fabric lining is in a light multi-toned wheat color.